Indigenous Sarayaku leader Patricia Gualinga speaks out about her pursuit of environmental justice in the face of a threat on her life. The struggle to protect the land and the environment in Latin America often costs lives. In 2017 alone, 116 environmental defenders were killed in the region, most of them for protecting their territories from activities such as industrial agriculture, mining, poaching and logging, according to the latest report by Global Witness. So when threats were made against land defender and Sarayaku indigenous leader Patricia Gualinga at her home in the city of Puyo, north of the Ecuadorean Amazon, it raised a red flag. This is the kind of dangerous situation that community leaders face every day. It was dawn on Jan. 5 when Gualinga was surprised by a man who broke the window of her room with a stone and threatened her. A policeman passing by her house chased the attacker but never returned. The next day, Gualinga went to the provincial prosecutor’s office to file a complaint. It took some time, but eventually the crime report was registered. In an exclusive interview, Gualinga spoke recently with Mongabay about that day. “I realized that it was a direct attempt,” said the indigenous leader, who over the past 20 years has focused her efforts on fighting against violations of Amazonian people’s rights — people who are against the operation of extractive projects in their territories. In the past six months, Gualinga has settled in Puyo to take care of her father, and in November 2017 she joined the Climate Change Summit COP23 in Germany to talk about the situation for Amazonian communities. Gualinga and her husband are now required to be part of Ecuador’s witness protection program, which will give them semi-permanent police protection and psychological support. On the same day of the attack, Amnesty International issued an urgent appeal to the Ministry of Internal Affairs to publicly acknowledge the work done by Gualinga and all territorial and environmental rights defenders. It also urged authorities to carry out an immediate investigation and make the results public. Gualinga’s name has been added to the list of threatened defenders called Speak out for Defenders project. The Sarayaku people live on the banks of the Bobonaza River, in the center of the Ecuadorean province of Pastaza. Their seven communities make up a population of around 1,400 people concentrated in the urban center. That center only corresponds to 5 percent of the 1,350 square kilometers (520 square miles) that their territory covers. Seen from above, Sarayaku looks like a green carpet of forest connected to winding rivers, said Mario Melo, the community’s defense lawyer. The community lives in the middle of the jungle, Melo said. “People are always friendly, they serve chicha [a purple corn drink] as an homage when you arrive,” he said. For Gualinga, it’s the area outside the urban center, closer to the primary forest, that she loves. Here there are small ranches where the Sarayaku usually go to pass the time with family. 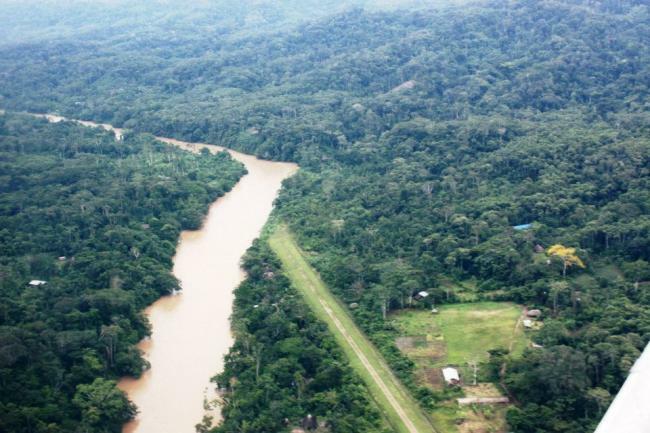 Aerial view of the Sarayaku territory, located in the Ecuadorian province of Pastaza. Photo by Carlos Mazabanda. “They are beautiful,” Gualinga said. “The forest is not being deforested, you can listen to the singing of the birds, and have medicinal plants at your fingertips.” The trips she made with her paternal grandparents to the banks of the Rotuno River are particularly fond memories. The depths of the living forest are home to many sacred spaces for the Sarayaku. These are the places where no human intervention is allowed. “There you can feel the presence of nature and the ecosystem,” Gualinga said. There are lagoons that are home to a variety of lizards, fish and anacondas. The Andayacu, Ishpingo, Rotuno and Capahuari rivers also flow here. But the community has struggled to keep its territory free of extractive activities, ever since the Argentine oil firm Compañía General de Combustibles (CGC) obtained a concession in 1993 of what was then called Block 23. In 2002, CGC entered the community with the objective of beginning exploration activities and buried 1,433 kilograms (3,160 pounds) of high-power dynamite, known as pentolite, to determine how much crude lay underground. “They were very tense moments, the people of Sarayaku went into a state of threat,” Melo said. Ultimately, everyone came together to fight back, and in 2012 the Inter-American Court of Human Rights (IACHR) ruled in favor of the Sarayaku in a case that the community filed against the Ecuadorean government, and that today is in the process of being monitored for compliance. Roa described this struggle as emblematic of the Sarayaku people: through discourse, they managed to unite their entire community. Gualinga’s role in this has been fundamental, according to Roa. “I think she has been a woman who has inspired many of these battles in Latin America today in the face of this extractive logic,” she said. She added that the interesting thing about Gualinga and her work was that it had not crystallized in individual terms, but in the representation of a group of people through her vocation as a Saramanta Warmikuna, or messenger of the Amazonian fight. Now the community must protect its territory from the possible exploitation of Blocks 74, 75 and 79, granted to PetroAmazonas and Andes Petroleum during the 11th oil round that divided the southern center of the Amazon into 13 blocks, according to Melo. “The government has a moral and legal obligation to comply,” he said. Gualinga is saddened, though, by what has been lost already. “We are no longer the peaceful community we were before, we are always on the defensive,” she said. She added that it was not a fair match for them to face large, wealthy companies that were often protected by the government. Defending the territory has taken many years of her people’s lives, she said. “We have not claimed our lives back,” she said. The Sarayaku people have proposed to Ecuador’s president, Lenin Moreno, that effective measures need to be taken to comply with the ruling. They have outlined a roadmap to involve the ministries of justice, the environment, hydrocarbons, the interior, defense and the treasury for this purpose. But according to Melo, this isn’t a high priority for the government. But once the Argentine company CGC entered her people’s territory, she remembers feeling that she had no choice but to join the fight at the insistence of her people. She decided to take the risk without knowing the possible consequences. She said the threats she faced earlier this year had revived her struggle and allowed people to become aware of what was happening with the oil blocks that interfered with her people’s territory. “They can’t intimidate us, what I did is what I had to do, defend what was right, that gives me strength, the indignation that makes us fight again,” she said. Her strength, she added, also comes from her father, Sabino, one of the yachak or sages of Sarayaku; her mother, Corina Montalvo, and the many people who showed solidarity with her after the attack. Gualinga said she was inspired to file a report about the death threat by many other women leaders in her community. “The Amazonian women have activated their fight again, they have begun to report their threats,” she said. This was the also case with Miriam Cisneros, elected president of the Sarayaku village in 2017, who spoke about the threats she has received and the theft of hard drives from her computers. José Gualinga, the oldest of Patricia’s four brothers, was also threatened when he presided over the community and now also advises the new authorities. His wife also received threatening messages at the time they were fighting the CGC. Other threatened leaders included Franco Viteri and Marlon Santi, two of the most visible authorities in the community. Gualinga recalled that another decisive moment in her life was when lawyers for the community asked her to be a witness during the case presented before the IACHR, and to be a translator before the court. She also made the final petition for the case and prepared the witnesses that the defense chose. Now the focus is on presenting a campaign that rescues the ancestral concept and the larger vision of this community, which seeks to show the rainforest as a living being and at the same time as the habitat of other human beings. For the community, this allows the balance between the elements of the universe. “They require special consideration, and activities such as those by the oil companies showed that these beings can perish or leave the territory,” Melo said. The community in Puyo seeks to promote a public policy proposal that respects this sacred nature of the forest and that can be included in the national constitution, which already recognizes the rights of nature. Gualinga said that in a few months she would leave Puyo to return to the sacred forests that fill her community with the necessary energy for their fight to continue.